The Tigon and the Liger is an interesting production. 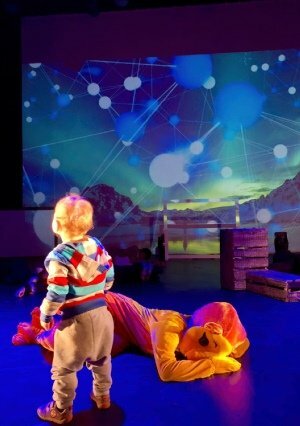 It begins like a workshop, where toddlers and very young children walk around amongst the cast participating in various activities, in an extremely relaxed environment. This is a great way to get young children involved and engaged and interested in theatre. To be honest, I was a bit confused, as I wasn’t quite sure whether the workshop was going to be transformed into a play with a story. I wasn’t disappointed, this does turn into a musical. Tyler the tigon was a unique big cat and there was an important story to tell – ‘know that you are unique in your own special way and learn to love the skin you’re in‘. Toddlers and young children are encouraged to explore the stage and be part of the play. The set is on the same level as the floored seating, which helps break down the barrier between the stage and the audience. As the children get more and more comfortable, the more they engage with the cast, dance with the cast to the songs and music, wander around and explore the stage as the play is being performed and generally they are allowed to be in a theatre without any of the normal restrictions. The cast are not phased by the extra challenge of children wandering amongst them and are still able to deliver the show. When this musical had finished, the audience were invited to explore the set, and look at how shadow dancing is created and even have a go, have a turn on the drums, ask cast members questions and of course, take pictures with the cast. Even though there were some confusing bits and maybe, just maybe the play was a bit too complicated for the age group, the children certainly had lots of fun, learned some tunes and a bit of sign language and more importantly they took away with them the key message of the play ‘to love your skin’. An excellent way to encourage the next generation to appreciate differences and diversity. Well done Chickenshed. The Tigon and the Liger is written by Keilly Swift, illustrated by Cosei Kawa and published by Lantana. Hey guys it’s me Ruby Bond I am really sad because I am supposed to be in the show with you. I miss you guys so much I really want to be in the show with you.